As members of the campus community, all faculty, staff, and students are committed to making our work, research, living and learning-places more inclusive, equitable, and just. 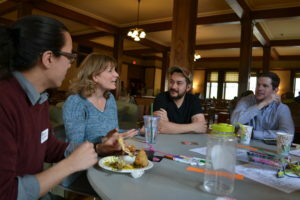 This encompasses preparing for a diverse, interconnected, global community; creating inclusive and respectful learning, living, and working environments; and aligning the efforts of social justice, equity, and inclusion across the campus. "Deeply transformative experience. Opened my mind and heart to new and more generous ways of approaching the social world, both the large and global world and the world of small group interaction."